In 1930, astronomer Clyde Tombaugh discovered a faint point of light orbiting the sun beyond Neptune. The new world “Pluto” was considered the ninth planet for 76 years, but in 2006 the International Astronomical Union voted to reclassify Pluto as a “dwarf planet.” What prompted this change in nomenclature? Clyde Tombaugh resumed the search at Lowell Observatory in 1929. He took photographs of various sections of the sky and then photographed the same sections days or weeks later. Since planets orbit the sun, while stars do not, Planet X would be in a different position on two photographic plates of a particular region of the sky taken on different nights. But of the thousands of stars in a typical photograph, how could he possibly notice the one that had moved? Tombaugh used a machine called a blink comparator. This device allows a view of two photographic plates in rapid succession. By shifting from one photograph to a nearly identical one taken some time later, the human brain is able to perceive any change. A planet will appear to jump back and forth when the plates are flipped, while the stars remain stationary. Tombaugh found Planet X (Pluto) on February 18, 1930, by “blinking” between two photographs taken a few days apart in January of the same year. Pluto was revealed by its own motion. Before Pluto, our solar system was neatly divided into the four terrestrial planets that orbit close to the sun and the four gas giants that orbit farther out. This new planet broke the mold, being a small rocky/icy body at tremendous distance. 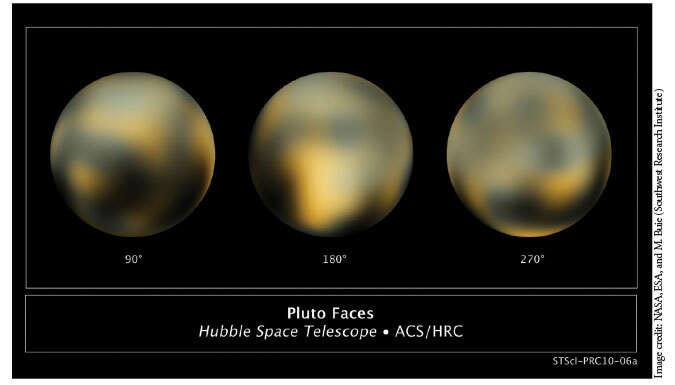 Unlike any other planet, Pluto showed no discernable size in even the largest telescopes of the period. This meant that it had to be much smaller than Uranus or Neptune and no bigger than Earth. As technology grew, the estimated size of Pluto shrank. By the middle of the 20th century, Pluto was known to be no larger than Mars, and by the 1970s it was believed to be even smaller. Using modern telescopes, we now know that Pluto is only 1,430 miles in diameter—about 18 percent the diameter of Earth—and smaller than any of the other eight planets. It has less than 1 percent of the mass of Earth. Such a diminutive world is not nearly massive enough to affect the orbits of Neptune or Uranus in a measurable way. It now appears that there never was any discrepancy in the orbits of these planets. So, the discovery of Pluto was serendipitous. The new estimate of its small size is one reason for Pluto’s demotion from planet-hood. But it’s not the only reason. In 1992, astronomers detected another object orbiting beyond Neptune. Designated “1992 QB1,” the object was a mere 100 miles in diameter—far too small for a planet. The following year, five similar objects were also discovered orbiting beyond Neptune. Over the next several years, dozens more of these distant masses were found, and we now know of hundreds. A few of them, such as Sedna and Makemake, are nearly as large as Pluto. With these discoveries, astronomers began to realize Pluto was not an unusual out-of-place planet but the largest member of a new class of objects—a trans-Neptunian object (TNO). As more TNOs were discovered, astronomers began to ask, “Should Pluto be reclassified?” For 70 years, school children had been taught that there were nine planets, but a new discovery was about to challenge old taxonomy. In 2005, astronomers discovered a TNO that is larger and more massive than Pluto.3,4 Now named Eris, this world orbits the sun at twice the average distance of Pluto. But how should we classify this new world? It would not make sense to call it a TNO but not a planet since it is larger than the planet Pluto. Either Eris needed to be classified as the 10th planet, or Pluto would have to be demoted. Since Pluto and Eris are far more similar to the hundreds of other TNOs than they are to the (other) planets, the International Astronomical Union opted to revoke Pluto’s status as a planet rather than reclassify dozens of similar-size objects as planets.5,6,7 With this new classification system in place, the solar system returned to having only eight planets, as it did before 1930. Pluto is a small world composed of rock and various types of ice, including nitrogen, methane, and carbon monoxide. It has a tilt of 120 degrees and therefore rotates on its side like Uranus. Pluto’s average distance from the sun is 3.6 billion miles, or 39 times Earth’s distance. On Pluto, the sun would appear over 1,500 times fainter than it does to us. The temperature of Pluto’s surface is -229°C (-380°F). Due to its extreme distance, Pluto takes 248 years to orbit the sun. The orbit of Pluto is inclined relative to the plane of the solar system by 17 degrees—far larger than the inclination of any planet.8 Also, its orbit has high eccentricity (the “squashed-ness” of the ellipse). Pluto is 1.79 billion miles closer to the sun at its closest approach (perihelion) than at its most distant point (aphelion). That’s a phenomenal difference! In fact, near perihelion Pluto is closer to the sun than Neptune. This was the situation between 1979 and 1999 when Pluto was considered to be the eighth planet from the sun, and Neptune was the ninth. But for the remaining 228 years of its orbit, Pluto will be farther from the sun than Neptune. It may seem that the two worlds might collide when Pluto crosses the orbit of Neptune. But their orbits are not in the same plane and never actually intersect. There is another reason why a collision could not occur. Pluto is in a 2:3 orbital resonance with Neptune. That is, Pluto orbits the sun twice for every three orbits of Neptune. Such a stable configuration guarantees that these two worlds can never be near the same place at the same time. Could this be a design-feature of the solar system? At the time this article was written we had no detailed images of Pluto because it has never been visited by spacecraft. Our best images are from the Hubble Space Telescope. But even Hubble cannot provide much detail on such a small, distant world. This situation should change drastically in July 2015 when the New Horizons spacecraft is scheduled to reach Pluto. Pluto has a thin atmosphere—sometimes. It consists primarily of nitrogen, methane, and carbon monoxide—the same composition as Pluto’s icy surface. Solar heating is sufficient to keep trace amounts of these substances in a gaseous state when Pluto is near perihelion. But as Pluto moves toward aphelion, its surface temperature will drop due to lack of sunlight. Astronomers expect that at some point the atmosphere will “freeze out” and drop to the surface. There is high hope that New Horizons will reach Pluto before this happens. Pluto’s other four known moons are all less than 100 miles in diameter. Each of these was discovered using the Hubble Space Telescope. All orbit in the same plane farther out than Charon and are named—in order of increasing distance from Pluto—Styx, Nix, Kerberos, and Hydra. Much less is known about other TNOs because they tend to be smaller than Pluto and are consequently harder to image. Eris alone is larger than Pluto, though only by about 1 percent. But Eris orbits 73 percent farther from the sun than Pluto, so images of this little world don’t reveal much detail. From tracking this dwarf planet, we know that Eris has a highly eccentric orbit that is inclined a whopping 44 degrees relative to the plane of the planets. The elliptical orbit brings Eris within 3.5 billion miles of the sun and out to a distance of over 9 billion miles. Spectroscopic studies suggest that the composition of Eris is similar to Pluto. We also know from Hubble images that Eris is orbited by a moon, Dysnomia. But this is about the limit of our knowledge of this little world. TNOs are further classified by their orbital characteristics. Of particular interest is a type of TNO referred to as a plutino. A plutino has the same orbital period as Pluto and is consequentially also in a 2:3 resonance with Neptune. A surprisingly large percentage of TNOs are plutinos, possibly having been influenced by the gravitational pull of Neptune. Some astronomers prefer the term Kuiper Belt Object (KBO) to TNO. The two terms are essentially synonymous, but KBO has a secular origin. Since comets cannot last billions of years and since we still see comets, secularists have invented a hypothetical source to resupply short-period comets over billions of years: a Kuiper Belt. This belt was supposed to be a disk of trillions of comet-size objects orbiting beyond Neptune. Contrary to expectations, astronomers instead found a few hundred much larger icy objects beyond Neptune. TNOs are typically tens of thousands of times more massive than a comet nucleus and cannot therefore be a source of new comets. Secular astronomers believe that many trillions of comet-size TNOs exist and simply have not yet been detected. But this remains to be seen. Thus, though it is widely used, KBO is misleading terminology. On the other hand, the term trans-Neptunian object is more objective and observationally driven. In any case, whatever we choose to call them, and however we decide to classify Pluto, these objects are fascinating and give us a small glimpse into the infinite creativity of our Lord. See my article on Neptune in the March 2014 issue of Acts & Facts. Lowell founded an observatory in Flagstaff, Arizona, in 1894. He was famous for believing that he could see evidence of civilizations on Mars. Specifically, Lowell believed he could see canals that the Martians used to transport water across their planet and sketched many of these. Of course, modern technology confirms that no such canals exist. Lowell was sincere but mistaken. He searched for Planet X until his death in 1916. Newer estimates indicate that Eris is only slightly larger than Pluto. But the uncertainties are such that we cannot rule out the possibility that Eris may in fact be slightly smaller. The extreme distance to both of these worlds makes exact measurements impossible. Scientists Discover Tenth Planet. NASA News. Posted on nasa.gov July 29, 2005, accessed January 15, 2014. This has inspired a new term in colloquial English: To be “plutoed” is to be demoted or devalued. The new word was voted the 2006 Word of the Year by the American Dialect Society. Not everyone was happy with this decision. But we would do well to remember that this is merely a matter of classification. Pluto is exactly the same world today as it was before 2006 or as it was before its discovery in 1930. It’s just a matter of nomenclature. Perhaps as a tribute to Pluto’s previous status, the IAU designated a new category “dwarf planet” that includes Pluto, as well as Eris and the largest asteroid Ceres. This new term is reserved for masses smaller than planets that orbit the sun directly and have sufficient gravity to pull themselves into a spherical shape. Pluto is both a TNO and a dwarf planet. So is Eris. This is not the first time in history that the number of planets in our solar system has been reduced by reclassification. In the early 1800s, astronomers discovered several small “planets” orbiting between Mars and Jupiter. As more of these tiny worlds were discovered, it made more sense to classify them as a new type of object—an asteroid or “minor planet.” Nonetheless, for nearly 50 years the first asteroids were considered to be “planets” until astronomers gradually began reserving that term for only the largest eight planets. The plane of the solar system, the ecliptic, is defined as the plane of Earth’s orbit around the sun. However, the orbits of the other planets are all essentially in this plane as well. Mercury’s orbital plane is offset from the ecliptic by 7 degrees, and Venus is offset by 3.4 degrees. All the other planets orbit within 3 degrees of the ecliptic. From a secular standpoint, it is surprising that the planets deviate at all from a common plane if they all developed from the same nebular disk. The center of mass is the “balance point” of a mass or system of masses. Imagine that Pluto and Charon were placed on a large seesaw. In order for the seesaw to be level, Pluto would have to be much closer to the pivot point than Charon. When the seesaw is balanced and level, the pivot point would be the center of mass of the Pluto-Charon system. For this reason, some astronomers have suggested that Pluto and Charon should be considered a double-dwarf planet rather than a dwarf planet and moon. This is the case unless the person is standing on the opposite side of Pluto or Charon. In the latter case, the person would never see the other world. Cite this article: Jason Lisle, Ph.D. 2014. The Solar System: Pluto. Acts & Facts. 43 (4).